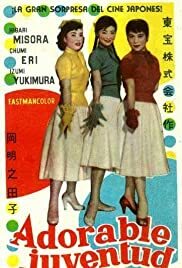 JANKEN MUSUME (1955, aka "So Young, So Bright") was the first in a series of Japanese films featuring "Sannin Musume," a trio of female singers formed for the purpose of these movies. There were four movies featuring the trio and other movies featuring only two of them, in different combinations. I first heard about Sannin Musume in the autobiographical manga, "A Drifting Life," by Yoshihiro Tatsumi, which came out in an English-language edition in 2009. Accompanying a drawing of the trio is the text, "A trio called the 'Sannin Musume,' comprised of Hibari Misora, Chiemi Eri, and Izumi Yukimura, became a huge hit as a result of their appearance in a movie." He doesn't identify the movie, but he clearly meant JANKEN MUSUME, which was Toho Pictures' biggest hit that year. Misora was Japan's top recording star of the postwar era and she made quite a few other films, as well as numerous TV and radio appearances. All three of the performers were born in 1937, so they were all approximately 18 years old when this movie opened. When I found that the film was available on DVD from CDJapan, I ordered it. In the film, Hibari plays Noriko and Chiemi plays Yumi, two high school classmates who meet the third girl, Piyo, played by Izumi, while on a class trip to Kyoto. Early on, we see Hibari in a kimono singing a traditional song while Izumi, dressed in full traditional garb and hairstyle, performs a dance. At one point, Chiemi, in modern dress, cutely steps up and introduces a Latin beat to Izumi's dance. The film is in Japanese with no subtitles, so I won't be able to provide any kind of a detailed synopsis. I was never quite clear on key plot points nor did I figure out the roles of all the various subsidiary characters, although their parents were, of course, easy to identify. The important thing is that there are 15 musical numbers in the film, 12 of them songs and three solo dances. Hibari gets four solo songs, while the other girls each get three and they all sing the title song together for the opening and the finale. Two of the songs were familiar to me. Hibari sings the French standard, "La Vie en Rose," in English, while Izumi sings "Smile," the song Charlie Chaplin wrote for his film LIMELIGHT (1952), in Japanese. Chiemi sings a big stage number, complete with male backup dancers dressed as "natives," about "Happy, Happy Africa," a mix of English and mumbo-jumbo lyrics. Izumi sings a "Cha-Cha" number with some English lyrics. It all culminates in a Kabuki-style dance show that Hibari stages in a theater in full traditional costume (which makes her parents quite proud). The finale has the girls on a roller coaster (shot in a studio against rear screen projection), each singing a solo, and then all singing together for the only time on screen to perform the title song, which has a "Janken," or "Jankenpyon" theme ("rock, paper, scissors"). Part of the earliest wave of Japanese color movies, JANKEN MUSUME is filled with gorgeous color photography, featuring a mix of outdoor scenes (including picturesque Kyoto sites) and elegantly crafted and designed interior sets representing the girls' homes, vacation spots, and parents' workplaces, in addition to the theaters and stage sets seen in two major sequences. The costumes, both modern and traditional, are all dazzling. It's quite a beautiful display of Japanese color cinematography and production design and it offers a seductive cinematic world, almost a Japanese alternate universe of Hollywood, that is easy to immerse oneself in. "Harmless fluff that were little more than showcases for the singing talents of the three stars, the Sannin Musume movies were wildly popular, especially among teenage girls. Izumi Yukimura played a with-it rock 'n' roller who sprinkled her conversation with English words. Chiemi Eri was a good-natured, tomboyish country girl who sang Japanized versions of American pop tunes. Hibari was the old-fashioned Japanese girl, who betrayed no hint of foreign influence in speech or song and stood foursquare for traditional values." "After her comeback, in July 1957, she told columnist Al Ricketts that she would rather sing in English than Japanese and expressed a liking for the music of Julie London and Nat King Cole. Her dream, she said, was to have an American screenwriter write a real Hollywood-style musical for her. 'I know it isn't possible,' she said, 'But I'd like to read one just to see what it's like.'" Oh, the possibilities. 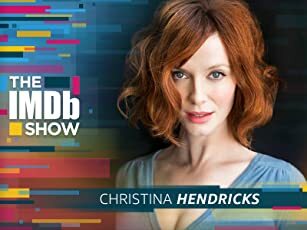 What if an enterprising Hollywood producer in that period had taken her up on it and brought her over to co-star in a musical with Elvis Presley? (She was, in fact, two years younger than Elvis.) What a pairing that might have been. Anyway, despite the film's lack of subtitles, I found it thoroughly enjoyable and filled with tantalizing hints of the kinds of musical numbers I've always wanted to find in Asian musicals. And the three stars are not only quite pretty and charming, but exciting performers as well, with Chiemi Eri, the short-haired, big-boned member of the trio, coming off as the most confident and aggressive and quite an animated scene-stealer. ADDENDUM (4/14/15): In the years since doing this review, I've seen the three later movies starring "Sannin Musume" and have reviewed all three on IMDb: ROMANCE MUSUME (1956), ON WINGS OF LOVE (aka OHATARI SANSHOKU MUSUME, 1957) and HIBARI CHIEMI IZUMI SANNIN YOREBA (1964).